I implemented a vimgolf client in Python. The user interface is similar to the official vimgolf client, with a few additions inspired by vimgolf-finder. The package is available on PyPI, the Python Package Index. It can be installed with pip. neuralart is a Python library and utility for rendering generative art from a randomly initialized neural network. It’s based on the following blog posts and pages from studio otoro. For example command line usage, see neuralart#example. For example library usage, see example.py. This post contains implementations of echo and printenv in 32-bit x86 assembly for Linux. echo is a Unix utility that prints its arguments to standard output. printenv is a Unix utility that prints the environment to standard output. The core functionality of these programs can be written in a few lines of C, where program arguments and the environment are passed as function arguments to main. When a process is executed on Linux (or other Unix-like systems), its stack contains pointers to the program arguments and the environment, as shown below. A Factorization Machine (FM) is a predictive model that can be used for regression and classification (Rendle 2010). FMs efficiently incorporate pairwise interactions by using factorized parameters. PyFactorizationMachines is a Theano-based Python implementation of factorization machines. Update 4/20/2017: The library is now available on PyPI, the Python Package Index. It can be installed with pip. For example usage, see example.py. Matrix factorization algorithms factorize a matrix D into two matrices P and Q, such that D ≈ PQ. By limiting the dimensionality of P and Q, PQ provides a low-rank approximation of D. While singular value decomposition (SVD) can also be used for this same task, the matrix factorization algorithms considered in this post accommodate missing data in matrix D, unlike SVD. For an overview of matrix factorization, I recommend Albert Au Yeung’s tutorial. That post describes matrix factorization, motivates the problem with a ratings prediction task, derives the gradients used by stochastic gradient descent, and implements the algorithm in Python. For exploratory work, it would be great if the algorithm could be implemented in such a way that the gradients could be automatically derived. With such an approach, gradients would not have to be re-derived when e.g., a change is made to the loss function (either the error term and/or the regularization term). In general, automatically derived gradients for machine learning problems facilitate increased exploration of ideas by removing a time-consuming step. Theano is a Python library that allows users to specify their problem symbolically using NumPy-based syntax. The expressions are compiled to run efficiently on actual data. Theano’s webpage provides documentation and a tutorial. The following code includes a Theano-based implementation of matrix factorization using batch gradient descent. The parameters are similar to those in the quuxlabs matrix factorization implementation. D is a second-order masked numpy.ndarray (e.g., a ratings matrix, where the mask indicates missing ratings), and P and Q are the initial matrix factors. The elements of P and Q are the parameters of the model, which are initialized by the function’s caller. The rank of the factorization is specified by the dimensions of P and Q. For a rank-k factorization, P must be and Q must be (where D is an matrix). Additional parameters specify the number of iterations, the learning rate, and the regularization importance. The code doesn’t contain any derived gradients. It specifies the loss function and the parameters that the loss function will be minimized with respect to. Theano figures out the rest! 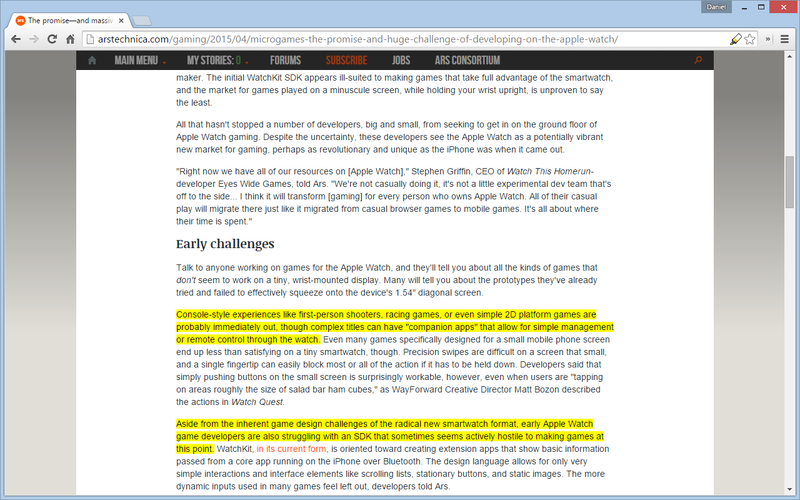 Auto Highlight is a Chrome extension that automatically highlights the important content on article pages. After installing the extension, a highlighter icon appears in the location bar. Clicking that icon highlights important content on the page.